Take your sister by surprise with these unique and cool gifts. Whether she’s a sister who loves journals, cooking, gadgets or simply pampering herself, there’s a perfect gift here just for her. And if money is tight we also have a range of homemade items to inspire you towards that perfect gift. This beanie is the ideal gift for all Harry Potter fans. Sister’s in particular will love this chic fashion item that’s 100% acrylic and an official licensed Harry Potter item of clothing. With the detailed Gryffindor logo emblazoned on the front, this hat portrays the magic of the young wizard. From the Unemployed Philosopher’s Guild, a small Brooklyn based company comes this surreal and enlightened mug. With just the merest shades of the great Tibetan leader, this fun mug will make a great gift for the worldly-wise sister who enjoys some fun with her coffee. 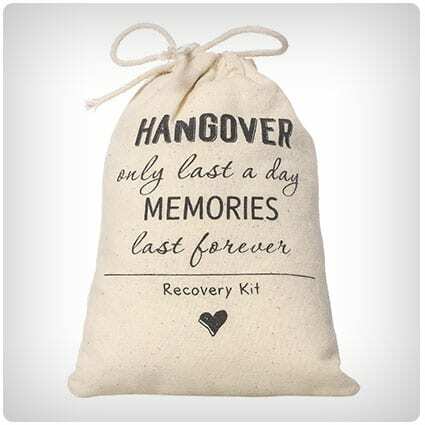 These cotton 4 x 6 inch hangover kit bags perfect for bachelorette parties and wedding favors. The natural muslin favor bag, with a drawstring closure is stamped with black “hangover” message are sold in sets of 10. Sporting a cute design, they are inexpensive and a great way to liven up any party. Personal and practical, this little book is the perfect gift for sisters everywhere. Complete each page’s fill-in-the-blank responses and simple prompts and you have the perfect personalized keepsake. Girls will love to pass on this little memento of love, respect or simple fun to a dear friend. Let the food menu be shaken up with this set of food dice, ensuring a random but balanced meal every time. A perfect gift for any cook, there are 9 dice in total covering many food options including meat and vegetarian. This is a fun accompaniment to any kitchen. Whether your sister likes to doodle or make copious notes as she is on the move, this smart folio is a great companion to have. A gadget pocket and a digital ballpoint pen make up a useful and handy holder which is easy to fit into any handbag or simply be carried by hand. This is a collection of the most up-to-date and thrilling DIY-tech projects around straight from the experts at “Popular Science” magazine. The “Big Book of Hacks” is the perfect book for aspiring makers, curious young techies and old-school enthusiasts alike. Charge up that drill, fire up your soldering iron, and get ready to hack! For the green fingered sister comes this terrific horticultural set. Grow fresh herbs, vegetables and more in this smart countertop garden. With up to 3 plants being grown at a time in water rather than soil, advanced hydroponics is made simple. This is a perfect gift that keeps on growing. This electronic Star Wars version of the classic Catch Phrase game challenges you to use your knowledge of the Force. There’s multiple levels of difficulty and Chewbacca keeps you on track at the end of each round. The Princess Leia in every family will love this smart interactive game. For the Harry Potter fan who loves to draw comes this stunning coloring book with over eighty pages of props and artefacts from the famous series. There’s hours of relaxation and fun to be had with this quirky and imaginative book that’s a dead sure gift for any fan. With more than eighty portraits, award-winning pet photographer and animal rights activist Seth Casteel captures strange sides of man’s best friend with his stunning underwater photography. A perfect gift for your dog loving sister who will love the quirkiness and sheer exuberance of these photographs. Handcrafted by Brian Kunkelman, this elegant stoneware strainer is at home in anyone’s kitchen. The all-in-one design has a built-in drip catcher and a spout for easy clean-up. A treasured and yet immensely practical gift that comes organic and handmade all the way from Pennsylvania. Pass special recipes on to future generations with this customizable holder of treasured dishes. With space for conversion tables, photo galleries and family reviews, memories of the home kitchen are sealed forever. With space for over 80 recipes this is a gift that will continue to give over time. The brain child of Boston marathon runner, Doug Storer, these pair of clip on lamps light the road without breaking your running stride. They provide 270 degrees of visibility in front plus two rear-facing taillights, making you visible from all sides. In high-impact, water-resistant cases, they’re powered by Li-ion rechargeable batteries. Spotlighting over 1,000 of the United States’ forgotten destinations, this book is ideal for the sister with some get up and go! Plan an unforgettable vacation with the super-easy reference that shows you where to go, how to get there, and what you need to know before you begin your adventure. There’s a bold sound packed into this rugged, water-resistant speaker that has a soft-touch silicone exterior for easy handling. Voice prompts talk you through Bluetooth pairing or you can quick-pair with NFC devices. There’s a massive 8 hours of play time for your sister to enjoy and it’s rechargeable with USB power sources. Get your sister the perfect reminder of where she’s from with this personalized jigsaw puzzle, centered on your Home. This fun and challenging jigsaw has a center piece shaped just like a real house to get you started. A timeless gift that’s playable over and over again. It turns out the Bard wasn’t as high brow as people thought! This at times smutty, and occasionally rude game, will be enjoyed by sister’s with a sense of fun and a slightly filthy mind. Based on Shakespeare’s famous sayings, this is for four or more over educated adults only. Politics has never looked so green! Now you can grow Hilary’s hair for her and support your favorite politician with water and a little tenderness. With 3 packets of seeds for multiple plantings and a growth cycle of 1-2 weeks, it’s time for the State-of-the Hair debates to begin. Made from recycled glass and mouth-blown by Mexican artists, this festive glassware set will delight sisters with its sleek and modern feel. With the varied colors of each unique glass, keeping tabs on your drinks at parties is a cinch. A stylish and practical gift that’s ethically sound. This set of six bath bombs has natural clay combined with mineral salts, shea and cocoa butters, sunflower seed oil and baking soda. Aches and pains are eased away with the antioxidants allowing your skin to cleanse and heal. And they are ethically sound as all ingredients meet Art Naturals’ 100 percent natural standards. This is the ideal gift for the tea loving sister in your family. Let her explore a world of flavor with this international set of ten, single-estate, loose leaf teas. The set comes with 10 tubes of tea, each with enough leaves to brew a 6-8 cup pot and an informative book. The sporty women in your family will love this Spikeball set of the 2 on 2 sports game played all looking like volleyball. Collapsible legs allow this set to be easily transported, fitting into the trunk, garage or closet. It comes with a lifetime guarantee making this an obvious gift choice. With its attractive Gift-to-Go box, this 15 ounce ceramic teapot and 8 ounce cup is a delightful gift for your favorite sister. A hanging card reads “There is no friend like a sister”, letting her know your feelings. The combo is microwave safe with a recommendation for hand washing. This bottle opener designed to look like a peg-legged pirate has an easy open lever, foil cutter and beer bottle opener allowing the owner to be the perfect party host. The device is made from stainless steel with matte black rubber and measures 4.5cm x 13.2cm. Perfect for that life of the party girl. Imagine your sister in this cool Patagonia truckers hat with its 6-panel design. There’s an organic cotton canvas headband with adjustable snap closure for the perfect head fit and she’ll look so cool with the original Patagonia original art displayed to all. Practical and stylish, she’ll be totally wowed! Your sister is in for a treat with this easy-to-use kit that makes a box of melt-in-your-mouth chocolate truffles at home. Amateur chocolatiers can customize their creations by mixing in any of the included coconut flakes, peppermint, vanilla, or Himalayan sea salt. The perfect gift for indulging her sweet tooth. Get her a touch of class with this craft beer pressurized growler which keeps beer fresh and carbonated for 2 weeks. The vacuum insulated stainless steel keeps the beer cold all day and the VPR cap maintains perfect carbonation. A top gift for your home brewing sister. Does she love craft? Then immerse her in the perfect accompaniment with this set of tapes which are great for journals, planners, calendars and more. With 20 rolls of tape (each 6inches by 32feet), vibrant colors and the highest quality, she’ll be able to use this strong repositionable, easy-to-tear tape for all her craft needs. More than just a head rest, this luxurious pillow has locally-sourced, barley and lavender stuffing its cotton exterior. With a quick two minute blast in the microwave, the barley puts out a long-lasting, muscle-relaxing warmth, while the lavender greets your senses with a calming scent. The perfect pampering gift for a treasured sister. This trendy and stylish gift is a perfect keepsake for any sister. Presented in a cotton filled jewelry box and ready for be given as a gift, this secretive necklace has a generous 28 inch chain as well as a discreet compartment with paper inside to write your private message. This delightful essential oil diffuser bracelet with its stylish and elegant beads in pastel colors is also a health benefit. The combination of beads and lava stones emit tiny bursts of calming essential oil scents which will delight sisters and help them keep their serenity all day long. Oils not included. With an advanced timer, auto shut off and an adjustable mist mode, this diffuser is top of the range. Help your sister’s inner calm with this practical and simple essential oil diffuser. Forget your scented candles and instead enhance the air in the room with this therapeutic vapor delivery system. Can your sister knock out a tune? Well now she doesn’t have to as she can drink and play sophisticatedly at the same time. These musical wine glasses have d blasted fill lines indicating a full A-major scale and with a simple rub of the glass rim, a crystal clear note will sound. Let her know what she means to you with this “Best Big Sister Ever” mug. The white ceramic mug has a black interior and white handle with motif printed on both sides. A whopping 11oz mug which is microwave safe and has a high gloss finish meaning its a gift she’ll use time and again. 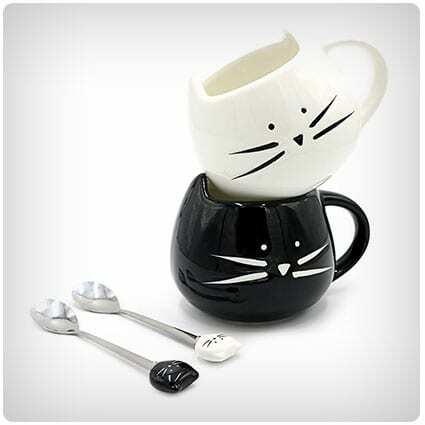 If she loves cats then she will love this pair of cute cat mugs and spoons. These are semi-handmade quality ceramic mugs with a hefty 350ml volume yet comfortable to hold. Suitable for hot or cold drinks but not the microwave or dishwasher, they are ideal for a feline-mad sister. Does your sister lose her house or car keys constantly? Does she seem to be hunting them constantly? Then this gift is ideal for her. The Tile key finder has a 200ft range and is louder than ever allowing keys and even the mobile phone to be found quickly and easily. Waterproof and extremely durable. Based on leading Productivity Principles and Supported Goals Research, This productivity planner will get your sister back on track. With weekly tracking and reviews, the pages are non-dated so as not to be wasted like in other planners. This is a timely gift for the sister who finds time seems to constantly run out. Strut your feline stuff with this crazy cat game. This unique card-based strategy game will have players collecting human affection, making mischief, and fighting for dominance at the cat bowl. Perfect for sisters who adore our feline friends and want a curtain climber of their own. For 2-6 players, ages 8-80. For sisters with classical imaginations comes this groovy pair of mismatched earrings. Cloisonné enameled studs, gilded in 22 carat gold, are set on hypoallergenic posts and come in a charming glass vial package. The gift from the heart that speaks to happy daydreamers of magical memories and wishful dreams. This terrific bonsai measures 9 inches tall and is 3 years old. Supplied from America’s largest bonsai nursery, this tree blooms prolifically in March and is a joyous centerpiece any other time of year. Sisters will love this bonsai, “Loropetalum chinensis”, the massive gift in a small package. For sisters who use the force, this R2/D2 teapot is a cool and funky addition to their kitchen. Made in high quality ceramic and an officially licensed piece of Star Wars merchandise, this teapot is also dishwasher safe and holds an impressive 36 oz. Let the little droid refresh their mug from this groovy gift. Let your sister be welcomed home in style with this unicorn door mat. Made in India, this colorful and magical gift is perfect for those whose imaginations take them to far greater places. Friends arriving at the house know that the owner is person who operates on that whimsical and higher plane. Pamper her with this bottle of thermal spring water which soothes and softens the skin, helping to minimize sensitivity. Providing anti-oxidant protection, this is the key element in all avène skin care products and regimens. She’ll thank you for this elemental and cleansing water as she feels the improvement on her skin. This sleek slip-on bracelet has a channel that holds thick or thin bands in place, alleviating the pressure from the elastic around the wrist allowing you to comfortably wear hair bands on the wrist. A perfect gift for sister’s who struggle with breaking conventional hair bands. An original sell-out success, this puzzle will drive you insane with its gradual change of color from one side of the spectrum to the other. Sisters will cast you a fiery glance as they take up the challenge of this devilish puzzle which has been called a therapeutic gift in some circles. For the sister who loves to travel, this book will serve as a perfect gift for the erstwhile voyager. With over 70 thought-provoking topics ranging from countries to visit to world cuisines to try, this sweetly illustrated journal will serve as a unique and inspiring time capsule for years to come. This multi-functional maternity pillow is the ideal gift for the mum-to-be. Your sister will thank you for this 100% cotton pillow which is high density and provides comfort for side sleeping and retains fluffiness for better performance and longer use. A favorite for expecting mothers and people suffering from hip or back pain. This pasta server is made from silicone featuring a dinosaur shaped head with pasta snagging teeth. Fun and practical, this great little gadget is top-rack dishwasher safe and allows the water to drain off your pasta through the eyes and nostrils of the dinosaur. A cool gimmick that really works which your sister will love. Does your sister know what wine goes with which food? Now you can solve the problem and help with the washing up with these clever cloths. Featuring two separate red and white guides, these easy-to-follow organic cotton tea towels are perfect for those new to the world of wine. This precise heat mixing bowl has technology to select from 70 degrees to 220 degrees Fahrenheit. With a digital display and an easy view glass lid for monitoring your mixing this gift is terrific for all sister who bake. This model includes a flex edge beater, a whip wire and a dough hook. Based on Tangrams, the geometric puzzles from ancient China, these clever linked blocks invite you to make a snake, a swan, a sphere, and many more clever creations. For intelligent sisters who like a challenge this colorful gift has hours of fiendish fun attached and endless creations to make. The Fitbit wristband is the ultimate gift for sisters who enjoy life on the go. With continuous heart rate tracking and maximized workouts using simplified heart zones, the Fitbit aids your everyday fitness goals. You can also see call, text and calendar notifications as well as tracking your sleeping patterns. These hand blown glass birthstone toppers are not just funky bottle adornments but also keep your beverages fresh. Created by heating clear glass to 2,000 degrees before rolling in bits of crushed colored glass, the designer then forms the vibrant globe. Handmade in Pawtucket, Rhode Island, these are a classy gift. From the hit TV show comes the board game for all the family. With 400 Cue Cards, 1 Card Sleeve, 2 Sand Timers and a Rules Sheet, there’s hours of fun for everyone in this optimum gift for your sister. Act out your TV dreams with this fun game. From original designs from Upstate, New York, comes this cheeky and fun mug that any sister will love. Made from ceramic and microwave and dishwasher safe, this is a fun gift. The bottom inside of each mug says Meow, surprising cat lovers as they finish their drink. This luxurious robe features a patchwork of reclaimed saris by a cooperative of artisans in a village outside of Rajasthan, India. Featuring saturated hues and varied patterns, each item is unique due to the upcycling nature of the product. Any sister will love this handmade item and cherish this gift for years to come. This best-in-class wine system keeps your wine safe from oxidation, allowing it to continue to age naturally. There’s a bottle clamp with grips making it easy to attach and providing a secure hold on the bottle whilst giving a stable pour. An terrific gift for wine lovers everywhere. These all-natural vegan and gluten-free soaps are crafted from popular red and white wine varieties with complementary scents and oils and berries, plums, and apples. With delightful fragrances, these handmade in Monroe, Georgia, soap bars make a refreshingly apt gift for a sister who loves varied and wholesome smells and scents. For the geography expert in the family, comes the most detailed scratch off world map on the market. Featuring beautiful, vibrant colors, accurate cartographic details, country flags and landmarks. US state lines are clearly outlined for you to track your adventures in America. This is the gift for sisters who like to travel. With the iconic words “Nevertheless She Persisted” printed on one side, you can choose to either display or hide away this important message. This soft fabric t-shirt combines style and sisterhood and will put a smile on your favorite sister’s face. A statement in both life and fashion! This set of bizarre glass coasters will tickle the fancy of any sister with a penchant for the unique. Stacked up in the right order you can even look down on the full brain! With rubber feet to protect your surfaces and measuring 4 inches x 4 inches, this gift is hand wash only. From jewelry designer Lauren Beacham comes this tribute to our solar system in necklace form. Sporting all the planets in our system, and Pluto, this gift is perfect for a sister into astronomy or fashion. Handmade in Maryland on an 18inch chain, each planet is represented by a digital image of the actual planet. These meditative pets make any outdoor space that much more diggable through their centering, yet distinctively doggy presence. Chinese characters representing loyalty are etched into the back of each figure and the sealed cement sculptures are designed to be weatherproof. A Zen-like gift for chilled out sisters. The artists infuse these hand-thrown ceramic mugs with various minerals during the firing process and finish each one with a lustrous, glossy glaze. Each mug is then crowned with one of four healing stones. Handmade in East Hampstead, New Hampshire, each mug is one of a kind and unique in appearance. Get relief for your sister’s eyes with these stone disks from Finland. Chill them in the refrigerator and apply on or under your eyes for a spa-like treatment at home. This is the perfect gift for a sister who enjoys the natural remedies of life that are also simple and effective. Is your sister a meanie? Then this is the game for her! Cards Against Humanity is a party game for horrible people. This second version has more than 150 new cards taking it over a 600 card total for repeatedly fresh gameplay. A choice of sensible or preposterous rules is supplied. Roasted in Tennessee, these 100% Arabica beans are infused in small batches with a touch of Kentucky’s finest for that unique flavor. A great tasting gift for the sister who likes a little added kick to her coffee. Although caffeinated, this coffee contains no alcohol but a bucket-load of taste! Cast in a premium metal housing, this carbonated drinks maker from Soda Stream is compatible with other SodaStream products and flavors. There’s a carbonation lever with a soft grip handle for ease of use, a 3oz carbon dioxide tank and a 1 liter BPA-Free reusable bottle. Give your sister the gift of fizz! The world’s bestselling travel book is back in a more informative, more experiential, more budget-friendly full-color edition. There are 600 full-color photographs and over 200 entirely new entries, including visits to 28 countries that were not in the original edition. Set your sister on her way with this worldly gift. Cocktails are a girl’s best drink and you’ll be flavor of the month with your sister when you purchase this gift with a kick for her. This gift includes three great Carry On Cocktail Kits and each kit has ingredients to make two cocktails, for a total of six in this bundle. In these days of pacifism, what could be a more appropriate gift than these yoga sensitive green army men. They come packaged in a “mini yoga studio” clear box with a bamboo floor. Your sister will die laughing at this set of emotionally sensitive toys. Finals around the corner? Or is work just stressing your sister out? Then ride to the rescue with this set of healthy snacks. A CollegeBox Bundle of 25 items! This 10.5in x 7.5in x 4in box is filled from bottom to top and all neatly organized and packaged securely. This excellent diaper bag has 6 total pockets and is large enough (19″x15″x6″) to fit most breast pumps and pump supplies. There’s a two way carry system and the bag is completely washable being made of durable cotton canvas. A magnetic snap closure give easy access while keeping everything where it should be. Designed by Sarah Burrows and Nick Behr and made in Illinois, these pollinators include nutrient-rich material and instructions for planting a one square-foot garden patch in a few simple steps. Let your sister make life easier for bees, butterflies and hummingbirds alike with this custom collection of seeds. An eco-gift for the environmentally aware. The birthstone wishing ball is made to capture a single wish, accomplishment, or meditation every week for the coming year. Each shimmering ball of hand-blown glass comes with 52 tiny slips of paper for you to pause once a week throughout the year and record a message of hope or gratitude. This stylus pen connects to your iPad or iPhone device and is in gold with a USB rechargeable battery. Your sister will love that the tip is designed to give line width according to pressure just like a real pencil. You can also rest your palm on the screen and not affect the writing. Make your sister laugh out loud with this comic set of socks. They feature delicious detail and a smooth, stretchy cotton blend for comfort. Made in South Korea, it’s summer all year round with these hilarious socks which are a surreal gift for Christmas time. This chopping board has a multitude of guide lines for different grid sizes and angles ensuring cuts are precise. Ideal for the sister-chef who likes quality, this board features guides for medium and small dice, brunoise, fine brunoise, batonnet, allumette, julienne, and fine julienne. The board is made of strong, and environmentally sustainable bamboo. This travel companion comes with clear sleeves to store your memorabilia, including postcards, maps, brochures, ticket stubs and snapshots. There’s also space in the margins to jot down every detail on acid-free paper. A top gift for the sister who seeks to get out and explore the world. What could be more pertinent for that handy-girl than this necklace come toolkit? There’s a five or two piece option, each with a myriad of tools which won’t rust or chip as they are made from stainless steel. Handmade in Portland, Maine, this gadget come jewelry is the gift for the modern woman. Get some hot nuts for your sister with this collection of worldly peanuts. There’s five unique seasonings to nosh on including: Caribbean jerk, coconut curry Thai, Mexican spiced cocoa, Moroccan harissa lime, and African piri piri. A cheeky gift that’s sure to spice up your sister’s life. This Nordic-inspired tea light holder hasn’t got just a single candle, it hosts a whole row of them, tucked behind the silhouetted branches of an evergreen forest of laser-cut metal. A delightful gift for those cold winter evenings, to be enjoyed atop your mantelpiece or as a centerpiece for the dinner table. What better way to let your sister know your feelings that with this embossed bracelet. Made of Environmentally Friendly, Lead-Free and Nickle-Free, this stylish bracelet will fit most sized wrists at 7″ diameter. Adjustable and with the legend “Always My Sister Forever My Friend”, this is a terrific gift for your dearest sister. This waterproof speaker can be wirelessly connected up to 2 smartphones or tablets. There’s a built-in 3000mAh rechargeable li-ion battery which supports up to 12 hours of playtime. You can even submerge this speaker in water so robust is its build. A cool and funky gift for the musically inclined sister. Welcome friendly, industrious pollinators such as mason and leafcutter bees with this interactive house. Made from sustainably sourced, FSC-certified wood, this custom condo for beneficial buzzers provides protection and an ideal home to raise baby bees. An environmentally perfect gift for the modern world. Delight your sister with the thoughtful message and aroma of this unique gift which looks perfect around any fireplace. Handmade and poured in the USA using only 100% Soy wax this is a safe and clean burning candle. The jars are fully recyclable and give off a stylish look. Personalized with your family name in place of an iconic, rock-solid brand name like Fender, this stylish door mat is a perfect way to welcome guests to your house. Made in Albany, New York, this entrance feature makes a stunning statement those approaching your house for the first time. Have a favorite place you’ll always remember? Then why not share it with that special sister in your life with this personalized bracelet. With the longitude and latitude on this bracelet’s alloy plate, they’ll never forget that special time and place. There are 5 rope colors and the length of rope is also adjustable. There’s no better combination than soup and a sandwich but there’s always the balancing act if you want to eat them from your lap. Not now with this custom designed plate that has ceramic counterparts to eliminate the inherent difficulties. This practical gift is also suitable for oven, microwave and dishwasher use. Trace your way around the world with this stylish cork globe. Seeing the world in three-dimensions will help your sister understand the true extent of her travels and will make a superb centerpiece for her bedroom or office. There’s red pushpins for special places or mementos of places she’s visited. This charm bracelet is made in the USA and tells of your fondness for your sister whilst allowing her to add charms of her own. Featuring 3 starter small charms and an embossed sister charm, this expandable gift is one she’ll cherish as well as being able to add her own touch to. Any sister would appreciate a versatile cooker when it can not only cook meat or vegetables but also produce cooked rice, porridge and even yoghurt. With the brand quality of Duo, 3rd generation technology and a stainless steel interior for safe cooking, this is a practical and elegant gift for the budding chef. Let your sister indulge her creative side with this elegant pom-pom bracelet tutorial. Whilst simple to do, there’s enough of a challenge in this tutorial to keep your sister engaged and she’ll be delighted with the bracelet she can then gift herself, or wear as a smart fashion item. Let your sister attend to her feet this winter with a coffee and sugar based scrub. Consisting of coffee grounds, cane sugar, sea salt and olive oil, feet will feel rejuvenated whilst the house will take on a fresh smell of roasted coffee. Different and very refreshing, it makes a unique gift. What better gift for a sister than this handmade decoupage plate? Using only basic materials it will be both unique and quaint as it contains the handprints of family members or even of close friends. An easy and fun gift to make that will be appreciated for years to come. Make the freshest mint extract right at home! Using two simple ingredients, mint and vodka, this method produces top quality extract to sit alongside the vanilla and rose petal in the baking cupboard. Sisters will have fun making this simple liquid base for their own cooking projects. Everyone loves a funky fashion change in their lives and with this cool piece of DIY, sisters can really stand out from the crowd. Using leather or suede, a few rivets and some simple tools, endless variations on trendy cuffs can be made and then worn immediately. Make your own Sriracha Salt using these simple instructions. Whether suggesting a great new flavor for your sister or making some yourself as a gift, this simple guide will have you making it by the bucketful. A great gift but be warned it is a little fiery. Is your sister interested in wildlife and the smaller plants around us? If so you can create this simple gift which will bring her hours of joy. The Succulent Terrarium is made using planting soil, a mix of small rocks and some locally bought plants. An easy but stunning looking gift for Christmas time. Using only a riveter, brown leather strapping, a hole punch, hammer and some material, you can create a fashionable tote bag for your sister. Following these easy instructions will produce a multi-colored bag which is still strong and durable and also handmade by you. Imagine giving a gift that allows the wearer to write their own message close to their heart. Now you can make that gift for your sister with these clear and easy instructions. Using easy to purchase materials this gift looks stunning and like it took more time to make than you ever had. Girls like nothing more than a sophisticated belt to wear around their latest dress or top. Now you can be her favorite sibling by making your own simple knotted belt. By following these simple instructions, you can produce a quality gift in no time and one she’ll look great in all year round. Need a fresh but low-budget Christmas gift idea for your adoring sister? Why not give the gift that’s practical and fun. Everyone always needs a stand-by box of cookie mix and why not dress it up with this comic mixing spoon. A simple but fun gift she’ll love you for. Soaps are always a popular gift at Christmas time but make your gift truly special by making your own soap with this simple process for at home use. Although your soap can be made in 1-2 hours, be well prepared as it will take 4-6 weeks to cure before use. Here’s a great idea for a gift for your sister, a set of bangles with an added touch to make them special. This tutorial takes you through how to dress up an ordinary set of bangles and add a unique color to various parts of each one. Adaptable so you can make various designs. Using some gloss paint and old beads, a stunning gift can be made by following these simple instructions. There’s no ends of colors to choose from, or designs of your own to add, as you produce an exciting piece of jewelry which will please any sister at any time of year. Make unique and personalized spoons using only nail paint! No experience is required to produce wild and crazy patterns along spoons or indeed, the handle of any piece of cutlery. Give your sister’s knives and forks a workout that will excite guests at her next dinner party. At a loose end for gift ideas? Then how about this nifty idea of a manicure in a jar. Sisters love giving themselves a little pampering every now and then and with this home-made gift they can do it in style. Cut the costs and max the thanks with this practical gift. Get your old t-shirts together and get ready to make a cool scarf for your sister. This nifty tutorial will take your through how to twist and manipulate your old tops to turn them into a stylish and unique gift. Environmentally friendly and a lot of fun, she’ll appreciate this hand-made gift. Handy with a sewing machine and ready to give a little time? This guide will take you through how to make a simple tote bag for your sister which looks classy in its simplicity. She’ll appreciate your efforts and more importantly the results as you are taken step by step through this easy process. Let your craft skills come to the fore as you make this gorgeous beaded head band. Using basic materials and skills, you’ll be guided through 7 simple steps to make a stylish gift for your sister. The headbands are suitable for fun or formal wear, especially any up and coming weddings. Is your sister a gardener? Then impress her with this home-made gardener’s scrub. Putting the moisture back into dry and cracked gardening hands is essential and with this tidy recipe, you’ll have some simple but effective rub that’ll do just that. A classic and timely gift. Hand embroidery is something that can light up any top and with this simple and easy guide, you’ll be making a top that dazzles any sister. Requiring only an embroidery hoop, needle and thread, plus a washable marker pen, you’ll create a decorative extra on any piece of clothing. Scarves are the ideal present in the cold weather and you can jazz one up with this useful DIY technique. By using metallic iron on transfer paper and matching cotton, you can add simple but effective styles to make even the most ordinary scarf come alive and be a truly striking gift. Keep it festive and on a budget with this home-made root beer dressed up in festive flavor. By using simple decorative materials, you will turn these staples of the fridge into the alcohol free spirits of Christmas. Fun and funky and a great gift for the time of year. Make a funky photo album and then fill it with all your favorite photos for that sister you love. This guide will take you through producing this cool album, advising on various styles and options with which to surprise your sister. She’ll love that you made it and how modern the item is. If your sister is into photography then why not give her a fashionable strap for her camera. This guide will show you how to liven up even the dullest strap by the addition of some smart sequins which will give her camera a new sparkle. Easy to make and cool to look at. Use your talents and learn how to make a cool origami necklace that your sister will be proud to wear. For a low budget cost, you can give her a look that she will adore and be asking for more. Adaptable in shape and style this is an oriental delight to look at. Give the gift of family pictures with this home-made photo wheel which is both effective and low cost. Easy to make with these simple instructions, this gadget will let you display all your favorite photos in a circle of happiness that will make it a gift to be treasured for a long time. Everyone needs a coaster for their hot drinks, so why not give your sister the gift of your own funky styles in this practical item. This guide will take you through the how and you can choose the style as you wow your sister with this robust yet simple design. Coffee isn’t just a great tasting beverage but can also be a boon for your body too. By following these simple instructions, you can make a professional feeling body scrub that will moisturize the skin and keep your body hydrated. Pamper your sister with this gift that’s very appropriate for winter. For those who just want an easier life or for the serious tech players, here is a great selection of essential gadgets to enhance every facet of your life. When you’re searching for a special something to give to a dog lover, or even for your own pooch, it can seem like there’s never anything ‘different’ available. That’s where you’re wrong – we have searched high and low and come up with a smorgasbord of doggy gifts for even the fussiest of fur babies. Can’t decide what to buy the girls on your shopping list this year? Grab a coffee, pull up a chair, and work your way through our extensive list to find the perfect gift for that special girl, whatever her tastes. If you strive to be the best gift giver around the Christmas tree this year, take a look at the ultimate collection of unique Christmas gift ideas for everyone on your list. From the youngest family members to the oldest, here is your one-stop-shop to impress everyone who matters the most. Dad doesn’t have to be hard to shop for this Christmas, and finding gifts for dads is now a breeze with this extensive list.